Extend your basic sewing skills into the fun world of clothing, and focus on creating and recreating your own unique designs. Learn how to select, cut, and stitch commercial sewing patterns. 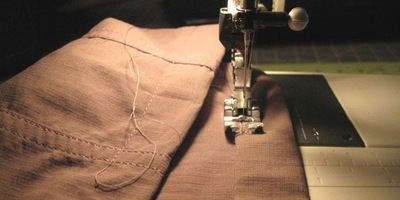 The class will also cover basic zippers, hemming, and other simple alterations. Patterns and fabrics are available at The Scrap Exchange and included in the class tuition, but students are welcome to bring their own patterns, clothing, and fabrics. Sewing machines and other materials are also provided, but please feel free to bring your own sewing machine also. Registration is suggested. Space is limited. Host of The Scrap Exchange’s popular 2nd Sunday Sewing free community meetup, Christine Ramsey has been an avid seamstress since the age of 7. She is a passionate and popular teacher who especially enjoys combining vintage and reclaimed fabrics in new and interesting ways. Christine lives, sews, and blogs in Apex, NC where she creates for her own handmade label, Kiki’s Rewind Designs. Register for any class at least 3 weeks in advance and receive a $5 store voucher good towards the purchase of any materials in The Scrap Exchange retail store! Voucher will be handed out at the beginning of the class, and will be valid for two weeks. The voucher may not be applied to Green Gallery items or programs. This voucher will only be given to students who register at least 3 weeks prior to the start date/time of the class. Are you a member of our Friends Club? Friends Club members receive a 10% discount on class registration fees. Go to http://www.scrapexchange.org/join-us/be-a-friend/ for more information on how to become a Friends Club member!